Do you have a dynamics processor? No, but I'm considering buying one. No, I don't think it's necessary. Whether you have just started on your adventure or you are a seasoned podcaster, you may be considering adding a dynamics processor to your setup. The MDX4600 from Behringer is commonly recommended to podcasters by other podcasters. However, getting it to work, and more importantly getting it to work well, can be a little daunting if you aren't used to the mumbo jumbo, and the user guide that comes with it isn't of very much help. In this hub I will walk you through a standard setup. The guide should be generic enough to get you going even if you don't have this exact model or brand. I will start by look at the wiring. Then I will explain each of the settings and how they work: the expander / gate, compressor / limiter and peak limiter. Finally, I will walk you through how to get the optimal settings for different types of uses. You may be tempted to skip directly to the pictures showing my setup. I strongly advise against this. If you have invested in this equipment, then you will benefit mostly from understanding how it works, rather than just setting the switches somewhere and leave them for all eternity. In fact, your audio may end up being worse than before. Also, you will need to adjust the settings when introducing new hardware, microphones or even guests. That being said, I hope you will find my guide useful. Good luck! Why should I get a dynamics processor? This topic merits its own article, so I'll keep it short. Your mixer probably has onboard compressors and equalizers. However, unless you invested heavily, the compressor isn't very good and its configurability is limited, and you should never use the equalizer for recording — it's for configuring audio for live performances with speakers. Also, a mixer is best at, well, mixing. What your mixer probably doesn't have are gates, expanders and peak limiters. Gates and expanders are mainly used to limit low-level background noise and peak limiters work to avoid peaks in your audio. Used correctly, these effects will greatly enhance the quality of your audio! So if you can get all that and a compressor along with it, one that is far better than the one on your mixer, you should now have enough arguments to get a dynamics processor. Inputs and outputs on channel 1, along with operating level switch. The MDX4600 has four channels, each with its own inputs and outputs. You're going to run sound into a channel, and do some processing on it and the processed audio will come back out on the output. So far so good. In this guide I will use the first channel for a microphone, the second for Skype audio (or a second guest microphone) and finally the third and fourth channels will be used for processing the final stereo mix from a mixer before sending it to a recording device. Each channel features two inputs and two outputs, XLR and TRS (1/4"). You should only use one input and one output at any one time - do not try to plug into both the XLR and TRS inputs on the same channel, nor output from both the XLR and TRS outputs on any channel. All inputs and outputs are balanced. Leave all operating level switches on +4dBu (not pressed). 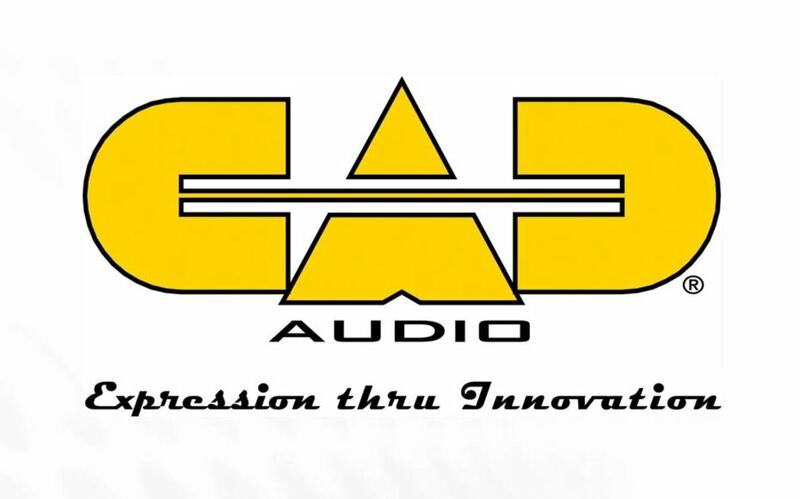 +4dBu is the standard operating level for professional audio equipment. For both channels 1 and 2 you will be using the insert ports on your mixer. Your microphone should already be plugged into the XLR or TRS line input on your mixer. If you have a standalone preamp, you may opt to connect the preamp directly to the processor input, and then connect from the processor output to the XLR or TRS line input on your mixer. So assuming you are going for the first option, you will need an insert cable. An insert cable allows you to transport audio both ways on the same cable, and whenever something is connected to the insert on your mixer, your mixer will reroute the whole signal, so only the processed (returned) signal will go into the post-fader mix, which is good to know if you were planning to record from the mixer's rec out, which is usually pre-fader, so the insert isn't applied to it. On one end the insert cable will have a single plug, with a tip, sleeve and ground. This end goes into the insert slot on your microphone's channel on the mixer. On the other end there will be two plugs, one labelled tip, the other labelled sleeve. The 'tip' goes into your input on the MDX4600, and the 'sleeve' goes into the output. If you're using a second microphone for a guest host instead of Skype, then just follow the steps for channel 1, only this time applied to channel 2. I use a second, old laptop computer for my Skype sessions. The setup is very simple, and is similar to the one for my microphone. I take the output sound (line out) from the Skype computer and input it into the second channel on my mixer. Then I run an insert cable on that channel to channel 2 on the MDX4600. 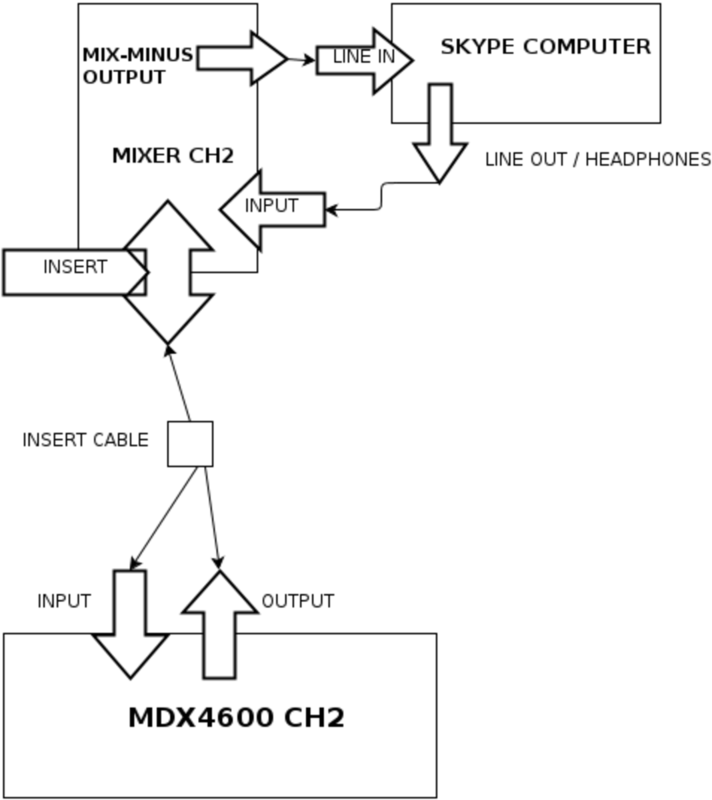 Optionally, you could run your Skype output audio directly from the Skype computer into the MDX4600, and then run a cable from the output of the MDX4600 directly to the input (not insert) on the mixer. The output line level of the computer is probably at -10dBV, meaning I have to use a lot of gain to get a good signal, resulting in more noise to keep out. I could probably benefit from using a USB interface also for Skype audio, but for now, I have opted not to. You could easily skip this step and choose to record directly from the output of the mixer. That would probably be a good option if you need to run more mics on the MDX4600, and you can't invest in another processor. If you can however, I recommend that you run your final mix through the MDX4600 before sending it to your recording device. It gives you the opportunity to do some compressing and limiting of the final signal, and adds a nice touch to the overall mix. In my uneducated opinion, it brings you a step closer to broadcast audio quality. The channels on the MDX4600 are mono channels, and you probably want to record stereo so you have to use two channels. Take the left out from your mixer and couple it with the input of channel 3 on the MDX4600. 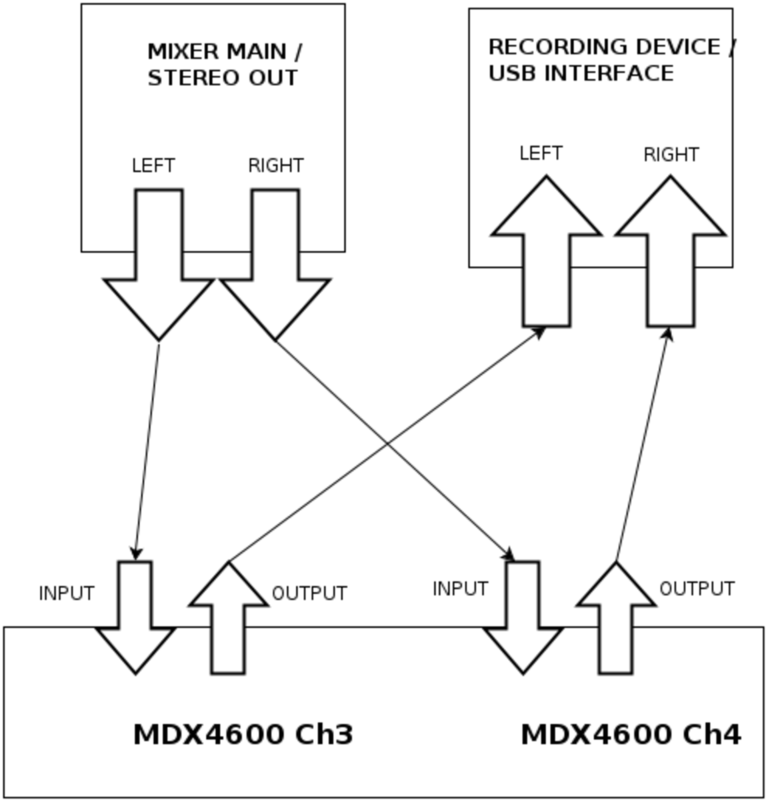 Then take the righ out from your mixer and connect it with the input of channel 4 on the MDX4600. Finally, take the output of channel 3 and connect it to the left input of your recording device, and you can probably guess what to do with the output from channel 4. There is at least one other option for your wiring. If your mixer allows inserts for the stereo mix, then you might want to use that, and leave the out to connect directly to your recording device. Don't hook up the MDX4600 through the AUX or EFFECTS sends and returns, because these will only add the MDX4600 output to the original audio, not replace it (unless you do some complicated routing with faders and switches that will just make your brain pop). I have a USB Audio interface with TRS inputs, which I in turn connect to the computer where I record with Audacity or GarageBand. If you don't have a USB interface, then you will need to get some kind of adapter to couple the two cables together into a single 3.5mm (1/8") TRS plug. I would recommend that you either get a USB interface or a standalone recording device (or both). After all, you have just invested money and time to get the rid of noise - you don't want some cheap consumer electronics to put it back in there at the finish line. Also, since the mixer outputs at +4dBu line level, and the computer line-in probably expects -10dBV line level, you will have to be very careful to lower the level sufficiently (also applies to Skype audio). So now you should be all set with the wiring! In this section I will explain what all the controller settings on the MDX4600 are and what they do to the audio. You could skip this section and jump straight to the individual settings on my standard setup, but I would advise against it. Since all recording environments, microphones, mixers, cables and so on are different, and thus produce different levels of noise, vocal characteristics and ambience your setup will benefit greatly if you understand how each setting works. Let us first take a look at some common sources of noise and how to reduce its impact on your audio, even before it enters the dynamics processor. 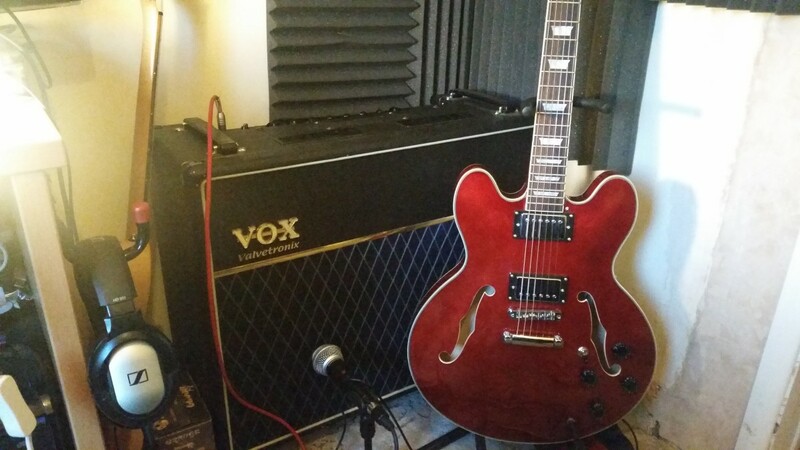 Noise comes firstly from the recording environment and its immediate surroundings. Unless you're in a completely soundproofed room, which I'm guessing you're not, there will always be some noise, perhaps birds twittering outside your window, your fridge rumbling or your furnace growling. Don't think that since you can't hear it, that your microphone won't. Try to limit the noise from these sources by turning them off (if they are appliances) or shutting them out. Also make sure to limit sound reflecting off of walls by putting up pictures and curtains. Finally, shut the door. The other type of noise is internal to your equipment: your computer, mixer, monitors and cables all contribute to some extent to adding noise to your audio signal. Of course, more expensive equipment will help reduce noise. For example, using balanced cables over unbalanced ones will help reduce noise, but unless you have very long cables it's probably not going to matter. It's also worth knowing that using gain to boost levels will also boost any noise already there. Finally, a USB audio interface will introduce less noise than the standard line in / line outs of your computer. Close-up of expander / gate. With trigger set a little below -20dB, GATE switch (on), release switch (off). The red led with down-pointing arrow is lit because the signal coming in is below the threshold set by trigger. Expanders and gates help you reduce noise, but have different ways of doing it. Let's start with the simples one: the gate. You activate the gate by pressing the GATE switch, so that it lights up green. The gate is very simple. You set a TRIGGER level (in dB) below which all sound is very brutally cut off or muted. There are two leds signifying whether the gate is open or closed. When the green led is lit, the gate is open and the signal is passed through; when the red led is lit, the gate is closed and no signal is passed through. You will generally start out with the TRIGGER switch it all the way to the left (off) and then move it clockwise until the green led turns red. I use the gate for my microphone and Skype audio. The expander is active when the GATE switch is not pressed (no light). The expander will allow a more gradual reduction of amplitude around trigger level. Instead of muting the signal at the trigger level, it will gradually decrease the strength of any sound starting a little above the trigger level. This allows for a smoother cut-off and is very suitable for music, or in my case, the final mix. 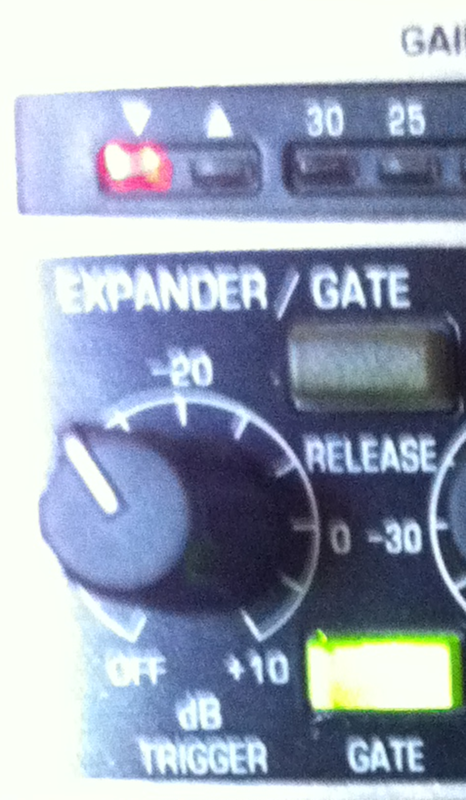 The expander / gate also has a RELEASE switch. When pressed, it will add a little delay before starting to cut-off your sound. I don't use the release button at all, but there are probably cases where it would make sense. The compressor / limiter area. In this particular setup, the threshold is set to -10dB, the dB ration to 4:1 and the dB OUTPUT to about +5dB. The countour low and enhancer switches are on, while the interactive knee is off. The gain reduction meter and the INPUT/OUTPUT meter, both showing no signal. “A compressor makes loud stuff quieter and quiet stuff louder so it becomes mostly the same volume and the material is literally thrown out of the speakers at the audience. The limiter part of the unit is like a brick wall so that if the sound gets up to that volume, it can’t possibly go any farther.” — Mark Bilger from his hub Sound System Processing Equipment. The compressor / limiter or just compressor for short, has a very specific application, namely to compress the loudness so that the difference between the lower and higher amplitudes becomes smaller. It means that when you talk soft, the compressor will make it louder, and when you talk loud, the limiter will make it less loud. It's the compressor that makes the characteristic omnipresence of broadcast radio. If you get this right, your voice will sound very professional. There are basically three switches that will determine your compressor settings: the THRESHOLD, the dB RATIO and the dB OUTPUT. Let's start with the threshold. The THRESHOLD switch lets you determine the level at which compression will begin. Compression will be applied to all audio above the threshold. If your voice is very soft, then a lower setting will help you make your voice more prominent. 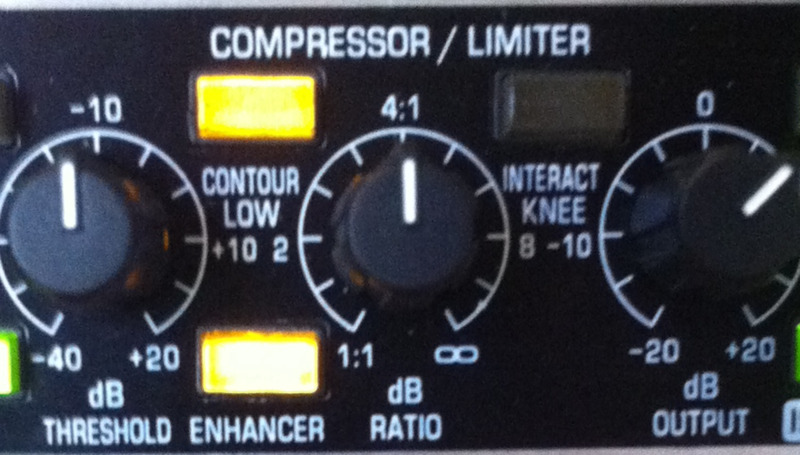 The dB RATIO switch allows you to tell the compressor how much compression to apply in terms of the ratio between the input and the output level. A ratio of 1:1 means no compression, a ratio of 4:1 will reduce the level by this ration. So if the input level to the compressor is 4dB it will reduce it to 1dB. The dB OUTPUT switch will let you adjust the final output level after compression. If compression results in overall level that is too low, you can increase it with this switch. The gain reduction as a result of the compression can be read from the GAIN REDUCTION meter. The dynamic enhancer can be activated by pressing the ENHANCER switch, so it lights up green. Since lower-level frequency bands carry more energy than higher frequency bands, they are more likely to trigger compression, in turn reducing the gain of higher frequency bands. The enhancer basically corrects for this. The INTERACT KNEE switch, when pressed will switch from "hard knee" to interactive knee application (or soft knee). Long story short, the switch makes the onset of compression more gradual, so that you are less likely to notice the onset of compression. I use it for the final mix, not my mics. The CONTOUR LOW switch uses the side-chain path to add a high-pass filter, reducing pumping that the compressor makes when encountering high-energy bass frequencies. The peak limiter setting is set to a little below +12dB. The LIMIT led is not lit meaning the peak limiter is not applied to the current output signal (signal level is below the set threshold). Let's look at the peak limiter. The peak limiter functions in the same way as a compressor but has a more aggressive attach and release. It limits the final signal before output. When the LIMITER switch is turned all the way to the right, there is no limiter applied. Turn the switch counter-clockwise until the OUTPUT LEVEL shows up to 0dB and occasionally above. When the limiter is applied to your signal, the LIMIT led will light up red. If the limiter lights up too much or all the time, you probably will want to reduce the level earlier in the path, for example with the dB OUTPUT. The limiter will help you avoid annoying peaks. Peaks sound really bad, so you really want the limiter to work for you. The I/O meter switch is on, meaning the the INPUT/OUTPUT level shows the output level. The IN/OUT switch is on, meaning the dynamics processor is enabled for this channel (not by-passed). OK - beforewe finish up this section, there are two last switches that should be explained. The I/O METER will alternate between the input and output signals shown on the INPUT/OUTPUT LEVEL meter. It is useful to compare input to output levels when adjusting settings. I usually leave this pressed (set to OUTPUT) by default when everythign is set up. The second has the label IN/OUT. This is very straight-forward - it serves to turn on or off the dynamics processor for that channel. Use this to compare the input sound to the output sound. Now that you have all the wiring set up, and understand the basics how the MDX4600 works it's time to turn it on. If you skipped to this section, then here's a final warning: if you simply set all settings to whatever I have on my setup, then you will probably be better off sending the whole thing back and save the money. All recording environments, mixers, cables, computers, microphones and so on are different, and will produce different amount of noise, ambience and other characteristics. If you don't pay attention to these, then the sound on your recording may end up sounding worse. Ok, press the POWER button, the big one on the right front side. Now, there may be some leds lighting up. If any of the switches light up, turn them off by pressing them. Also turn any turning swithces to OFF (all the way left or all the way right depending on the switch in question). It's time to set up the microphone on the first channel. I'll assume that you have done all the wiring, and that you have turned your microphone on. Turn all micrphone gain down on your mixer and on the microphone if it has its own gain switch. You'll want the sound coming into the MDX4600 from your mic to be as clean and unaltered as possible. We'll start with the compressor, because it is easier to set correctly when the expander and limiter aren't working the sound. So make sure the TRIGGER and LIMITER switches are set to off. Also make sure the IN/OUT switch is on (green led is lit), and that the dB OUTPUT is set to 0 dB (twelve o'clock), and the THRESHOLD all the way to the right (+20dB). Start out with setting the compression ratio. This setting is perhaps the most difficult to set, so use your ear and listen to your own voice while talking as you normally would during a recording. Usually, a ratio of about 4:1 is suitable for voice. When you have found a good ratio setting, start turning the THRESHOLD switch counter-clockwise, until the onset of gain reduction. You can see this when the gain reduction meter starts lighting up. I set mine so that my loudest speech reads a gain reduction of between 6 and 10 dB. That sets my THRESHOLD to about -10dB. Now it's time to adjust the dB OUTPUT, to make up for the lost gain. You can figure out how much gain you've lost by turning the I/O METER switch on and off while speaking at a constant normal level, and read the difference from the INPUT/OUTPUT LEVEL meter. Mine shows about a 6dB difference, so I will set my dB OUTPUT at about +6dB. Next, let's set the gate setting. For my microphone use the gate, not the expander. Having the TRIGGER set to OFF, the gate leds should be indicating that the gate is open. Slowly turn the switch clockwise, while not talking into the mic of course, until the leds switch to red. When it does, you have reached the level of background noise in your recording environment (as captured by your mic). I turn mine even a little further to get rid of breathing and keyboard typing. In my case it means setting it at about -22dB or just before twelve o'clock. I will also leave the RELEASE switch off. Finally, set the peak limiter by slowly turning the LIMITER counter-clockwise, while talking at your loudest normal level, and stop when the limit led starts blinking. This way you will ensure that any sound above your normally loudest speech level will be limited, so you will avoid peaks going back into your mixer, for example if you accidentally cough into the microphone. I also like to set the ENHANCER on, but leave INTERACT KNEE switch off. Settings for my microphone on channel 1. If you're using a second microphone on this channel instead of Skype audio, just repeat the steps for channel 1. In fact, you should be repeating this process every time you change your recording environment, or a different person will be talking into the microphone. While adjusting the settings for the Skype channel, it will be useful to have someone talking on a Skype call while you adjust your settings. Alternatively, use to Skype test calling service. Remember to give the caller a mix-minus audio from your mixer, so they won't hear their own delayed voice. The process for setting the settings for Skype will be very similar to setting it for a microphone. The only difference is that you may have more noise coming out of your Skype computer, so you'll want to set the noise gate TRIGGER higher. Also, the overall level may be lower, so you'll want to apply more compression at a lower THRESHOLD, and a higher dB OUTPUT, to get the level of your Skype audio to a level similar to your microphone's. Remember to set your peak limiter properly as well, by monitoring the LIMIT led while you adjust the LIMITER switch. Finally I'm going to explain how to use the third and fourth channels to modify the final stereo mix before sending it to a recording device. There's two switches I haven't told you about yet, and you will find them on channel 2 and channel 4. They are labelled COUPLE CH1 and COUPLE CH3 respectively and allow you to couple the settings for two channels together, so you only have to set settings on one of them. This is especially useful when running stereo through two channels, like in this example. You still have to set the dB OUTPUT on the channel that you "couple out". So the first thing to do, starting out with all settings on channels 3 and 4 in neutral, is to press the COUPLE CH3 switch on channel 4. Also make sure to turn on the processor for channel 4, by pressing the IN/OUT switch. It should light up green. Set the dB OUTPUT to 0dB. Leave everything else in place. 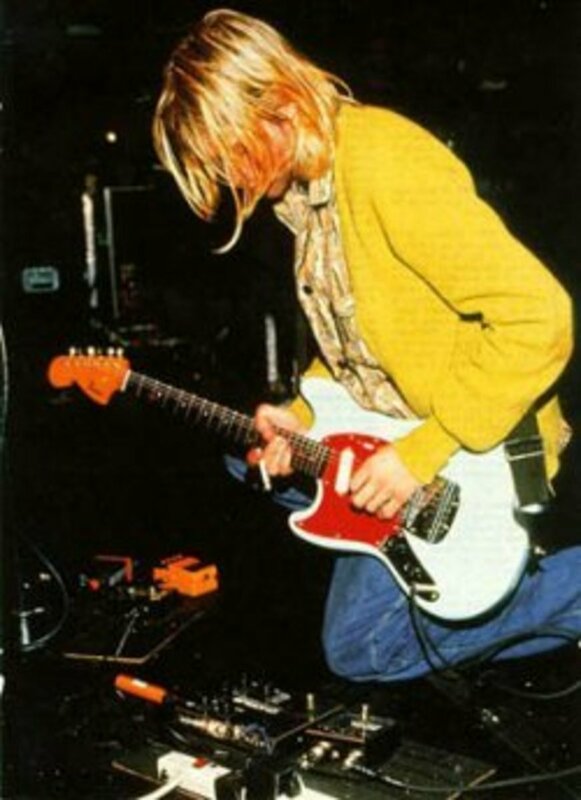 Turn your attention to channel 3. Make sure all your switches are in off position. Turn on the processor for channel 3 by pressing the IN/OUT switch so it turns green. Since we have not pressed the GATE switch (it is not lit up), we now have the expander enabled. Remember, we have it enabled now for both channels 3 and 4 since we have coupled them together. Turn down all the faders on your mixer. The green led with arrow up just above the EXPANDER/GATE area is probably now lit, meaning the gate is open. You will want to start turning the TRIGGER on channel 3 clockwise until the green led switches to red. Congratulations, you have now gotten rid of the noise coming out of the stereo out. Now it's time to turn on some music or a previously recorded show. Just make sure that sound is flowing out of our mixer and into the MDX4600. Music is a good choice, because it will make it fairly obvious when you apply too much compression. You will want less compression on the final signal, than what you had on your microphone. Start adjusting the THRESHOLD, by starting out at +20dB, and then turning it counter-clockwise, until you reach the amount of gain reduction desired (read it off of the GAIN REDUCTION meter). I'd say that somewhere between 1dB and 6dB is a good amount of reduction. Next, start adjusting the dB RATIO. This is where you'll have to listen carefully. If you have music on, especially with a lot of bass, and you'll find that it starts pumping a lot, it's a good sign you have turned it a little to far. Once, you hit that point, start going back until the pumping goes away. That's where you want to set it. To be sure, usually it shouldn't be set a lot higher than 2:1, and 4:1 is probably too much. A little pumping is OK, since we will reduce it later with the CONTOUR LOW switch. Now you will have to compare the input and output levels by switching the I/O meter on and off. Take note of the average difference over a small time period. Then you have to add gain with the dB OUTPUT switch by about the same amount. Now it's really important to understand that although you have set your settings on only channel 3, compression is now also applied to the signal in channel 4. Since the channels contain different signals (namely the left and right signals) there will be different amounts of gain reduction, and therefore different amounts of gain you will have to apply to make up for it. That's why you will have to monitor the leds on both channels, compare with the I/O METER switch on both channels and finally adjust the dB OUTPUT switches on both channels. Set the peak limiter to your desired maximum output level, by turning the limiter switch. A little above 0dB should be OK. If you end up with the LIMIT led constantly lit up, under normal levels of music or talking, then you probably want to reduce some gain earlier in the path. The peak limiter is there to prevent annoying peaks in the signal when there is unusually high levels in the signal (coughing for example), but it doesn't sound so good when the peak limiter is constantly applied to your signal. If you've made it this far, then you should feel confident enough to adjust the settings of the MDX4600 to your specific circumstances. Thanks very much for this useful info Tom - it's very hard to find any details on the setup of this product. It has been quite a problem getting the MDX 4600 to work effectively, but with your help I am making progress. My setup is EV RE20, with Cloudlifter into a ZED14 mixer. The only way that I can get a decent level of sound is by pressing the operating level button in (you suggest" operating level switches on +4dBu - not pressed in). Just wondering if this is normal considering the equipment I use. Another bizarre happening is that when I start the a recording session, the volume in very quiet... then slowly it increases to normal operating levels. This is problematic in that people listening to my podcast may think that I am not broadcasting. This doesn't seem normal so wondering if you have encountered it before. 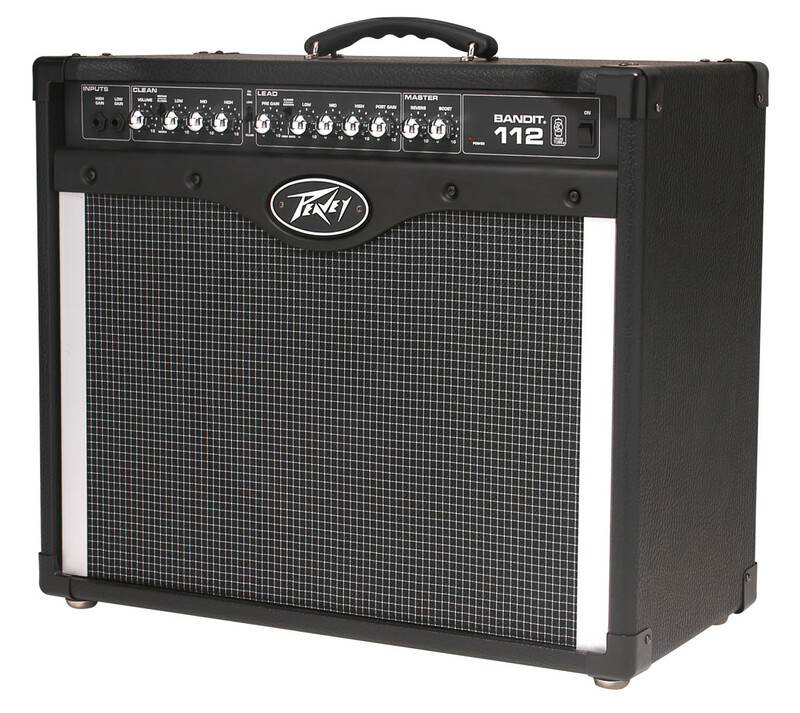 Hi Tom, I purchased a 4600 yesterday to use with live performance (Rock band). I set up a guitar through a distortion peddle to the XLR input on channel 1 of my mixer and set the gain to hold the output at around zero Db. I then attached the balanced end of an insert cable to the insert slot of the same channel and each of the TR plugs to their respective input and output slots in the back of the 4600. The signal to the powered speakers from my mixer is cut off when I do this no matter what settings I use on the 4600 + I don't seem to get any signal to the 4600 either. My mixer is a Cerwin-Vega CVM-1624FXUSB unit. The only way I seem to get signal to the compressor (4600) is by running the insert cable through the TRS Line in jack below the XLR slot (which the guitar is attached to)... What am I doing wrong to get out put to my speakers using the insert cable properly? Another quick question, you can answer it whenever you feel like it. Here is a photo of my settings (the bottom compressor is the one connected to the iPod). I tried everything, but still, the music is not ducking. If I'm not going to be recording with music, do you still recommend using Ch 3 and 4 before I go to my recorder? And how would I go about setting up those channels if it's just voices? Thanks for your feedback - very happy I could help! Happy holidays! You are Da Man! :) Thank you very much. Your answers are right to the point. I asked several podcasters and most of them didn't have strong background in audio engineering, and I asked audio engineers and most of them didn't have enough information about podcasting. Go figure! But you nailed it! You have both knowledge in podcasting and audio engineering! So, thank you thank you thank you! I suppose you could do what you suggest. But even better, why don't you use the insert slots? Right underneath the MIX-L and MIX-R outputs on your mixer, there are two TLR inserts. You can use a couple of insert cables to connect those to one channel each on the compressor. The output from MIX-L and MIX-R will then have passed through the compressor, and you can run cables from MIX-L and MIX-R directly to your channel splitter. Note also that the different outputs on a mixer may differ in terms of what they actually deliver. For example most REC OUTs deliver PFL, pre-fader level mix, and those usually bypass the inserts. That's probably a good argument to use a channel splitter, like you suggest. Again, thank you very much. It does make sense. But, if I only run the final signal from my main mixer outputs to the compressor, that will mean the final signal that is coming off the other outputs of the mixer won't be similar to that one of the main outputs (i.e. the stereo outputs to the digital recorder). Correct? So, what I thought of doing is after running the final signal from the main outputs of the mixer to two sepearate channels inputs on the second compressor unit, I will then add a pair of cables to run from the compressor outputs to a channel splitter I already own (Rane SM 26S), which will split the final signal from the compressor to 6 mono channels that I can pair into 3 stereo channels. Finally, each pair goes to a different device with equal final signal (one pair to the firewire, another to the digital recorder, and the last one can feed into my DSLR Camera). What do you think? doable? Really thank you very much. You have been very patience and helpful. No problem Dr Aljonaid. I'm trying to see where your wires go in your schematic, and it looks like you have the ch3 and ch4 outputs from your MDX4600 going into a stereo channel on your mixer. That's good! So about your second compressor unit. You don't really want to connect it to the first unit. Again, if you want to run the final mix signal through the compressor, you will just have to follow the instructions above. Only this time, apply it to your second unit, and use the channels of your choice. Looking at your diagram, it looks like your output final mix is going to your firewire interface, through those yellow arrows. If you want to run that signal through the compress, simply run those yellow arrows to separate channel inputs on a second compressor unit, and then add a pair of cables to run from the compressor outputs and to the firewire interface. Note that the compressor is not a mixer. None of the channels can mix their audio together. "Coupling" in this case simply means to couple the *settings* together, not the audio signal. Thank you. I really appreciate the fact that you are taking the time to answer my questions. Really appreciate it. What I meant is that in the inputs of Ch3 and CH4 I have an external audio device (iPod) going through. So, basically I have all 4 channels occupied which wouldn't allow me to send the final mix through the compressor. So, my question was, if I get another compressor (like you mentioned in your article), how will I be able to connect both compressor together and finally send their final mix to the mixer and audio interface through them? I am basically using MDX4600 for music ducking purpose. My be a link to a diagram of my (well, kind of complicated set-up) can show you more of what I mean. Dr. Aljonaid: I'm not really sure what you are asking. Can you elaborate? If you simply want to run your final mix through the compressor, you can just use channels 1+2 or 3+4 on the second unit. You couple channels 1+2 with COUPLE CH1, or channels 3+4 with COUPLE CH3. Thank you very much for this amazing explanation again. 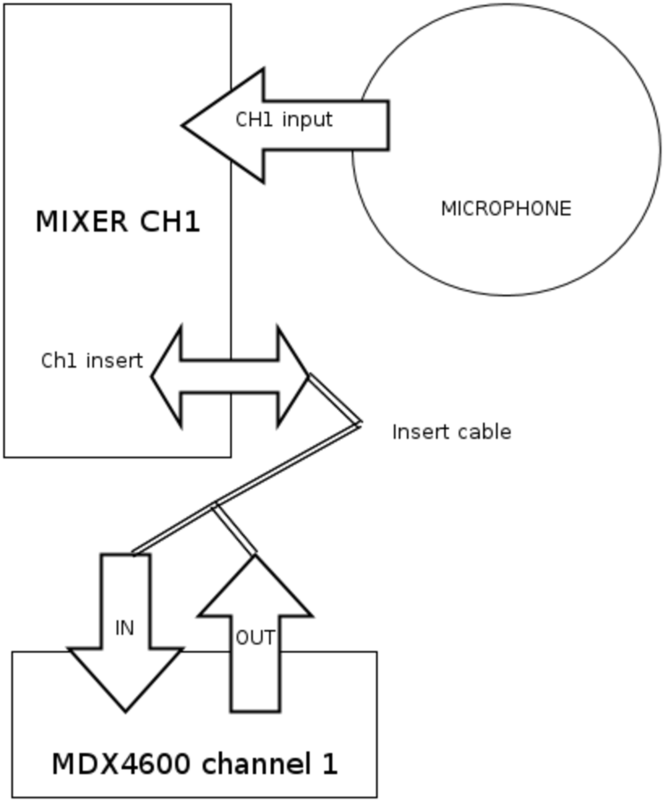 I hocked everything up according to this, but I think I will need another Behringer MDX4600 since I am using ch1 for mic1, ch2 for Skype and ch 3 and 4 for a stereo signal coming from "Radial Engineering ProD2" which had iPod connected to it for music. My question is, if I got another Behringer MDX4600, how do I connect that so that I can reroute both compressors signals back to the mixer like you suggested with using ch3 and 4 on a single one? Dr. Aljonaid: I don't have any experience with USB interfaces other than my cheap Yamaha Audiogram3, and I have not found it causes humming. TJ: Thank you for your feedback, and it's a thrill to know you found it useful! I was actually thinking while writing it that it will be too long and detailed, but in the end, I think it's what I would have wanted too. Now about your gain question. That depends on your microphone! Specifically, how much gain your microphone delivers by itself. You should monitor the output of the mic using the PFL (pre-fader level) on your mixer. Speak (or sing) into the microphone using your normal level of volume, and the level output should be around 0. If it's below 0 add gain slowly until it averages around 0. If it's above 0, turn the gain all the way down, and add gain until the level averages around 0. Quick question: Should the gain on the mixer be set to Zero or turned ALL the way down (-10)? What a great article!! I stream high school sports and getting optimal sound for my commentators has been a learning curve. When I started I thought having 2 headset mics and a 4 channel mixer was all I needed for an ESPN type production. WRONG! Long story short, after quite a few equipment upgrades, learning how to use it was now the challenge. Your article was better than any Youtube video I could find. Very precise, easy to follow and I will now go thru the setup steps you outlined on my MDX4600. THANK YOU!! Thank you very much for this great article. I have a question though, what would you recommend for a USB interface for Skype audio? I was thinking about BEHRINGER U-CONTROL UCA222 but I heard that they cause a lot of humming. Any suggestion? @Richard: You can easily hook up 4 mics to your compressor. Just note that it only has 4 channels, so you won't be able to connect anything else to it. @Ryan: This can be for a number of reasons. Did you check that you don't have some gain setting cranked up somewhere in the chain? What does your setup and wiring look like? I installed my compressor before my mixer in a student radio station, and I am getting a hiss from it. No hiss before compressor was installed. 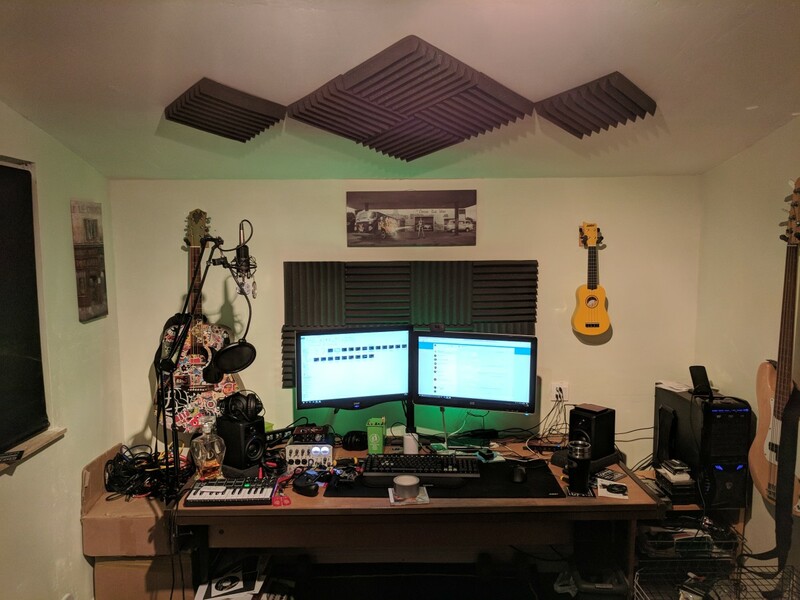 I currently have 4 mics and use LINE OUT to my mixer so I can play music/skype on live shows. Noob question, is there going to be complication for me to use my 4600? All of this information was very useful. Voted up! I realize that my article is a little unclear about this. Remember that the function of the output knob on your processor is to add whatever level you lost during compression. If you find yourself adding more level than you lost (compare input and output), you might want to increase the input level by adding gain on your mixer (or preamp). My point about turning the gain down on your mixer is really about making sure that the input isn't too high, because you want to reduce the added noise (and the chance that it could possibly peak) to a minimum, not that it should necessarily stay all the way down. First, I just want to make sure your IN/OUT switch pressed in so that the IN/OUT meter is showing the output level. Now, are you saying that you don't get *anything* on the output meter, or just that the level never reaches "LIMIT"? Remember, you don't really want your output level to reach "LIMIT" because that means the signal that goes back to your mixer is peaking, and cutting off, which is really bad. It's a good thing that it doesn't reach LIMIT, and that's what the peak limiter part of the MDX4600 is for. You want your output to average around 0dB at the peaks. That being said, if you feel that your input level from your mic is too low, you could experiment with adding gain with the preamp (mixer gain), but be careful to monitor the input level while you adjust the gain, and make sure your input comes in at about 0dB at the peaks. One question... Before reading this article I had the mic on my mixer up at about 75%. Now it is down at 25%. You suggested having it down (Turn all micrphone gain down on your mixer and on the microphone if it has its own gain switch). With this setting I sound great but for the life of me I can't get the LIMIT LED to light ever - even if I scream and have the limiter switch turned down to Off. Is that right? With my original gain setting it was coming on all the time. Really appreciate this piece. Thanks. 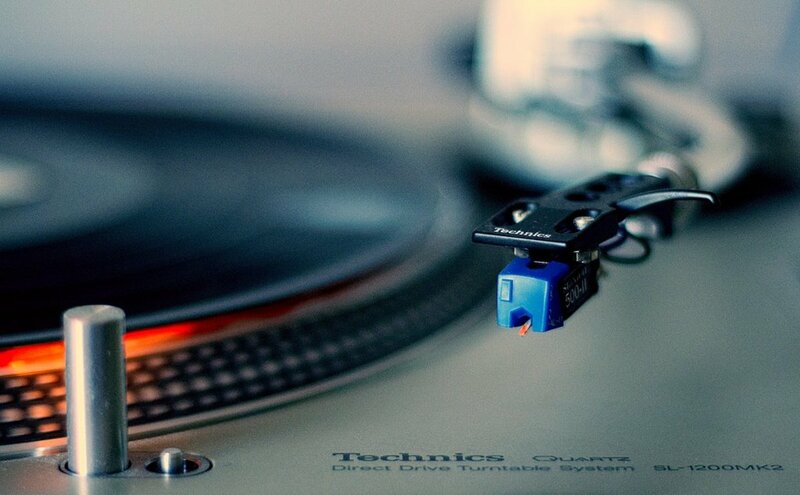 ZeroEnna: Yes any stereo (trs) to 2x mono (ts) will do. Normally, the output will be on the tip, and the input will be on the ring, on the stereo plug that goes into the insert on your mixer. what kind of Insert cable do you use? Just a regular Stereo to Mono TRS cable or are there any sepcial purpose cables? The example here is with a condenser mic, settings for dynamic mics such as the SM58 might be different. You might need to add gain with your (built-in mixer) preamp in order to get an OK signal. Are you saying you have to crank up the gain on your (mixer) preamp? And still you don't get a good signal? "Turn all micrphone gain down on your mixer and on the microphone if it has its own gain switch. You'll want the sound coming into the MDX4600 from your mic to be as clean and unaltered as possible." I have to have the gain cranked up or I do not get anything into the MDX4600. The meters only light up with the gain on my mixer turned up. Am I doing something wrong by having to turn up the gain? An excellent guide. Thank you. Sounds good (not a pun)! I also added a few Heil PR-40s, in addition to my Blue condenser mic. I'm currently using the EV re320 which seems to be very nice. I've considered condenser mics, but decided to go the EV dynamic route instead. Thanks again! It's nice to hear that my article is useful! 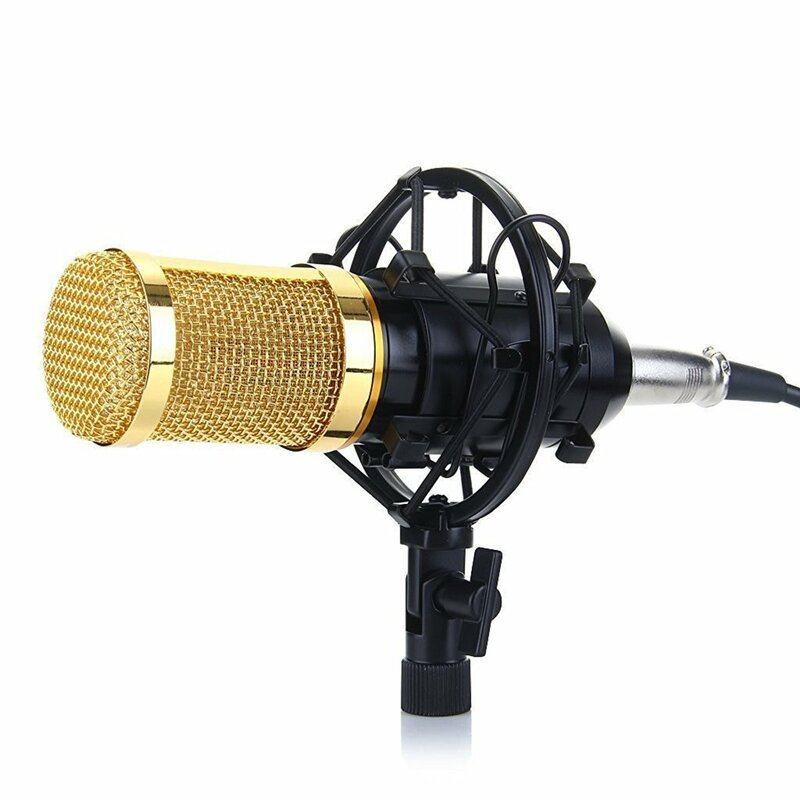 My friends who are into professional audio always tell me that if you're gonna spend money at all on good audio, then start with good input, meaning a high quality microphone. If the quality out of your mic is bad, then no expensive equipment can make up for it. Other than that, I've been thinking of adding tube pre-amp, to reduce the amount of gain (and thus noise) I have to add without one. Thank you so much for laying this all out. We would've been lost otherwise. Just recently started reading about the benefits of a compressor. Didn't hesitate to buy my MDX after reading this and seeing good reviews about the product. Seems to be working great. Any other suggestions to improve audio quality and add to the rack mount? Thanks again! Thank you so much. Great article. This is such a huge help!! I'm using a condenser mic but it shouldn't make a difference, except that condenser mics require phantom power from your mixer. Are you using a dynamic or condenser mic with your MDX? Thanks for the complete explanation. It is certainly better than the actual Behringer literature! I actually have the MDX2600 2 channel unit which has similar controls so I was able to use your explanation of the 4600 to get things rolling. I am producing a podcast on technology and am going to do one on compressors. I am wondering if I you would be ok with me linking to your page as a resource and me also using some of your explanations, giving you credit and links of course.